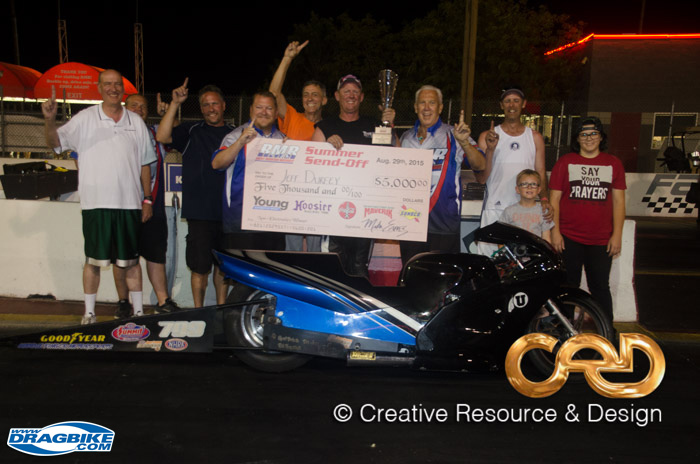 Rocky Mountain Raceways in West Valley City, Utah hosted the annual “Summer Sendoff” three day bracket races on August 28th to August 30th, 2015. It’s a rare chance where the bikes/sleds are lined up against the cars. Since the bikes don’t have electronics due to the usual Summit ET rules in the Division, all the bikes ran in the “No Electronic” classes over the weekend. After this year, the car guys might not want us back! Each day one of the bikes ended up winning. Gary Oaks, Las Vegas won Friday night, then on Saturday, August 29th, Jeff Durfey, West Jordan, UT beat Gary Oaks in the final. 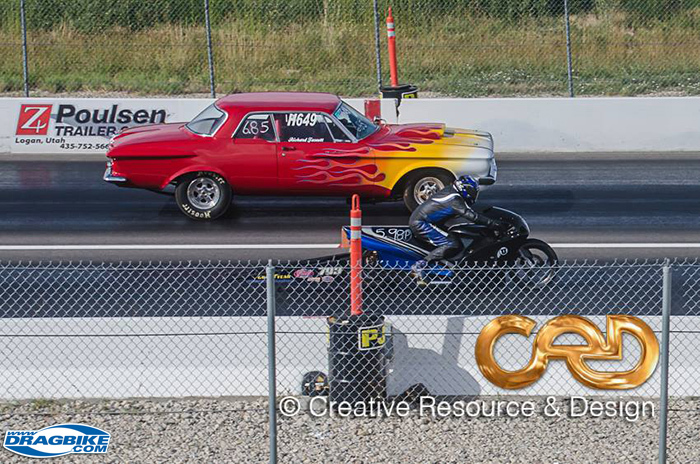 On Sunday, August 30th they shortened the race to 1/8th mile but that didn’t stop Jeff Durfey from winning that against Idaho’s Richard Fassett. With that win on Sunday, that put Durfey into a tie for the most rounds won overall for the weekend. They had a run off against one of the electronic dragsters (Josh Herman) but he redlight by just -.001. Friday’s race was an eight rounder with well over 100 in the no electronics class. The bikes faired well with 5 of the 18 left in the fourth round were bikes. Gary Oaks was joined by Danielle Tremelling, Kelly Queensberry, Matt Fredericks and Larry Mota. There was some bad luck on the ladder in the fifth round when Kelly Queensbury’s Harley-Davidson was taken out by Larry Mota’s Suzuki. Danielle also lost in the fifth round but great showing by everyone by having three bikes in the final ten! 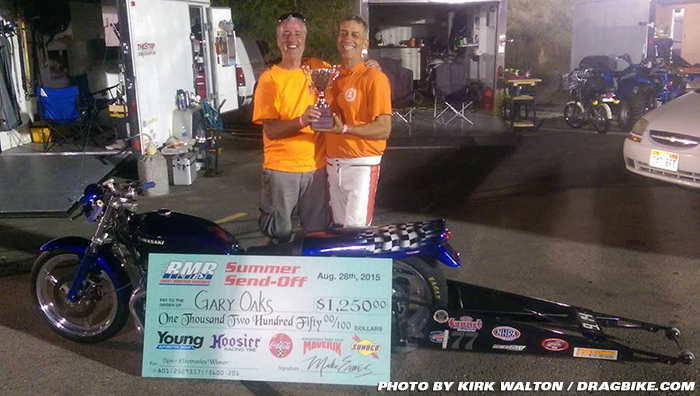 Gary Oaks lined up in the final against the Monroe, Utah dragster of Garrett Parsons. The winner would receive $1250 for the win. Gary on the ’78 Kawasaki runs a 9.185@142.38mph on the 9.14 dial in time. Garrett ran 9.770@124.86mph on the 9.68 dial in time. Gary had the reaction time advantage of a .052 to and .082. 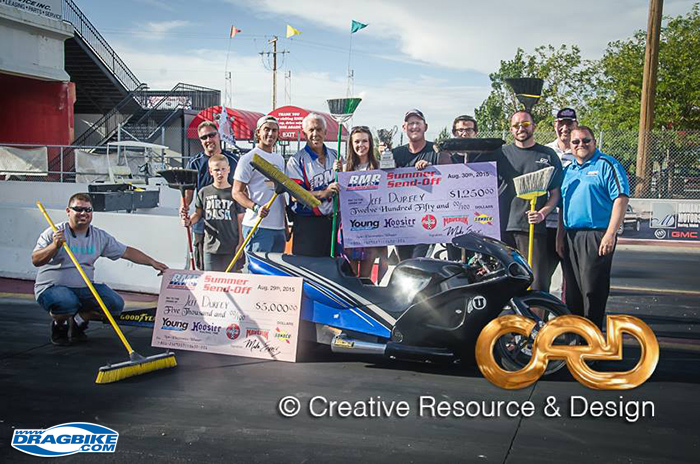 Saturday’s race was even bigger with the first place prize money going up to $5000. Again the bikes did well with four bikes in the fourth round. Mike Cragun, Larry Mota, Gary Oaks (who ironically took out Garrett Parsons again in the next round) and Jeff Durfey were left. Again, two bikes paired up in this round and Jeff Durfey took out Mike Cragun. Larry Mota went out in the round but Oaks and Durfey went on to meet in the final. Gary had the advantage at the start, a .005 vs .024 but quickly spun the tire and couldn’t run his 9.18 dial in time and ran 9.257@142.72mph. Durfey ran 9.528@133.27mph on his 9.49 dial. Sunday’s 1/8th mile race again saw the bikes do well with Mike Cragun and Jeff Durfey getting into the semifinals. Mike lost to Richard Fassett’s Plymouth in a close one which would pit Fasset vs Durfey for the final. Durfey ended up running 5.99 on the 5.98 dial to pick up another $1250 for the win. Again, great showing by all the motorcycle/snowmobiles and hopefully we can get more to show up next year since it was a lot of fun this weekend!